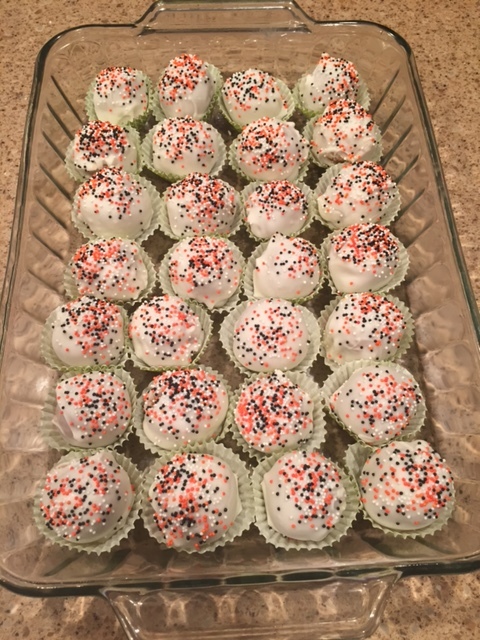 I had an inclination to try making some type of cake balls (or cake pops) for a while, but I was slightly intimidated at first. 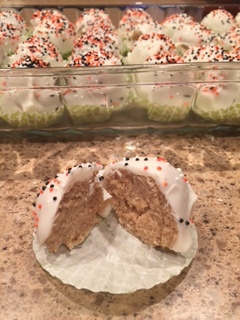 When my husband told me his work was celebrating Halloween with a carry-in, and we were invited to a party the following day, it seemed like the perfect time to try them out. I decided a few weeks before to do a trial run to make sure it wouldn’t be a complete disaster. To my pleasant surprise, they weren’t as difficult as I had thought. There are a few steps in the process so they do require some patience but the end result is well worth it! They may not look “perfect” the first time or two but they will get better with some practice. Chop up the almond bark/candy coating and melt over low heat stirring regularly until smooth. 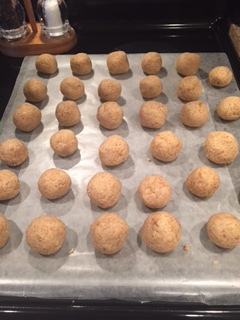 Gently dip in each ball and use a fork to turn/coat completely. 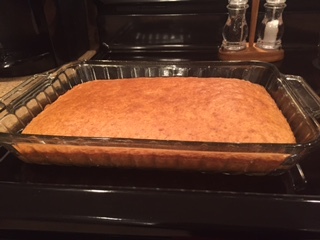 Once coated, place back on parchment paper to set. While coating is still “wet” add sprinkles or decorations you desire. I usually dip about 6-8 balls and then add the decorations, if you wait too long the coating sets and the sprinkles won’t stick. Once the coating is set trim off any excess drippings or coating that has pooled around the bottom, add to mini cupcake wrappers and VOILA! 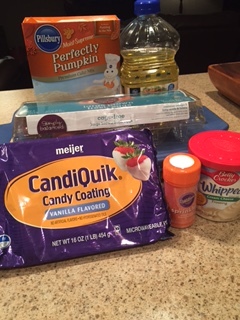 Pumpkin is perfect for Halloween & Thanksgiving, but you can use a variety of flavor combinations of cake/frosting/coating that will work for any occasion including Holidays, Birthdays, etc. Cake balls are perfectly portioned, individual servings, that are hassle & mess free to transport & serve…what more could you ask for in a treat?